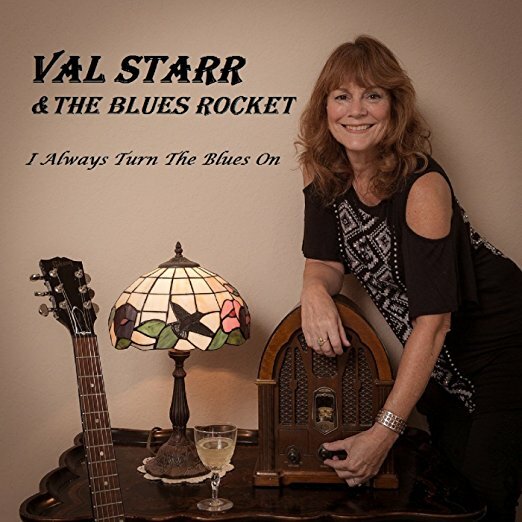 I just had the opportunity to review the most recent release, I Always Turn The Blues On, by Val Starr & The Blues Rocket. Opening with shuffle track, High Time To Go, Val Starr, lead vocalist and rhythm guitarist has the floor showing G&R vocal styling in true Axl flare with John Ellis on bass, Frankie Soul on lead guitar and Paul Farman on drums. Boogie track, Whether Blues, with it's droning bass line gives Daniel Castro a real nice chance to stretch out showing his blues chops on lead guitar. A real cool shuffle track, You Better Stop has a super walking bass line and fluid guitar lead by Steve Wall. Bad Luck & The Blues has a real nice feel with some of Starr's best vocal work on the release, lower octave guitar work, nice piano work by Todd Morgan and complimentary harp by Tim Baron. Two stepper, The Baby Mama Song shows a twist of country highlighted by Starr's vocals and the key work of Morgan. Bye Bye has a real nice slinky feel and a light touch by Starr on vocal. Barron's harp additions are spot on and Soul's guitar lead is tight and clean. Wrapping the release is It's Always Somethin', a shuffle track with an easy feel. Harmony vocals behind the lead add nice warmth and melodic guitar lead gives the track sparkle for a solid closer.